The Agilent 71209A microwave spectrum analyzer provides full sweep from 100 Hz to 26.5 GHz, plus built-in external mixer capability. Its superb frequency accuracy, amplitude accuracy, and repeatability let you perform even the most demanding satellite tests. As part of the Modular Measurement System (MMS) family, you can choose a configuration that best meets your requirements in performance, size, and price. Adding accessories such as a preamplifier or tracking generator is very easy. 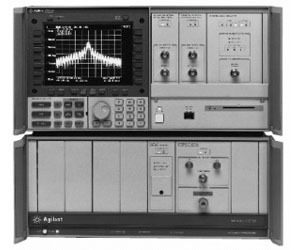 For automated testing, the Agilent 70000 series of spectrum analyzers are compatible with the Agilent 8566B. Their proven reliability and repeatability allow a three-year calibration cycle, giving you a very low lifetime cost.